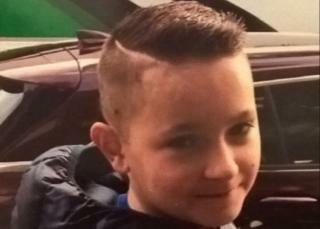 A fund to help the family of a 12-year-old boy who died after being hit by a car has reached more than £7,200. Police said Taylor Tolley was struck as he crossed Brett Street in Bridlington at about 17:30 GMT on Friday and died of his injuries on Saturday. The death of the school boy is apparently the third road tragedy to have hit the same family. Officers are supporting Taylor's family and Humberside Police has appealed for witnesses. Sherri Miller, who created the Go Fund Me page on Saturday, wrote on it: "Totally devastated for the family to be going through this for the third time now after Taylor's dad passed in a car accident 11 years ago and his step-dad passed away six months ago in a motorbike accident". Taylor's step-father, Andrew Tolley, 29, of Bridlington, died in hospital following a crash on the B1229 between Buckton and Bempton on Sunday 2 September. Taylor's father, Stewart Swift, 18, also of Bridlington, died after his car hit a tree on the A165 near Carnaby in May 2007, reported the Bridlington Free Press after the inquest. Kate Parker-Randall, the head teacher of Bridlington School, has said in a statement the school had "many fond memories of Taylor as an active and vibrant young man". The money is being raised for funeral expenses to allow Taylor to be laid "to rest without the stress of money", according to the fund-raising page that has a target of £7,500.